Ah, the annual art drought. So little to see and even less to say. But it’s March already. Time to get back to work even if it is a little post the event…. post even for The Post Post. Ironically, or perhaps completely appropriately given the fact that it was January and Sydney-siders one and all were immersed in sale-trawling, a gratifying, greed tinged frenzy of selfish buying (and at a good price too!) after all the culturally proscribed giving of Christmas, the best thing I saw all summer was not in a gallery at all, but at the coalface of consumerism. I was actually on a bus, on my way to the MCA to see the much hyped, Recorders by Rafael Lozano-Hemmer when the window display in the massive Louis Vuitton store on George Street caught my attention. 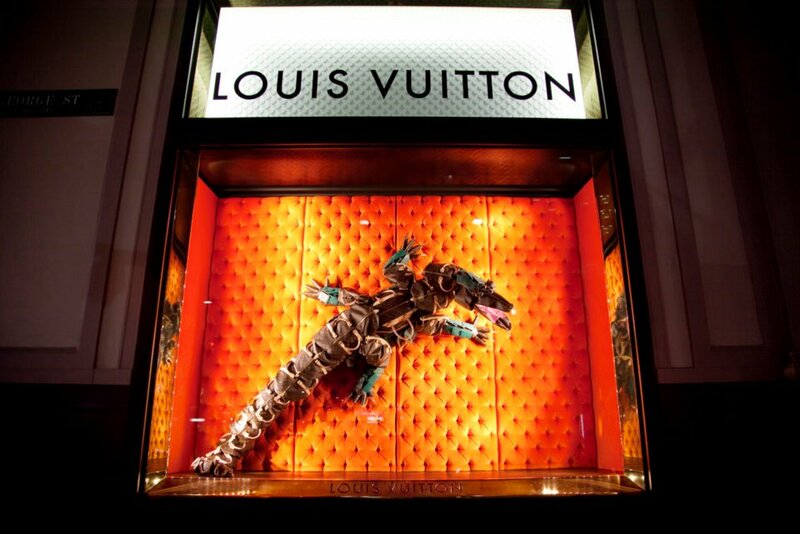 Someone had turned all those outrageously priced handbags into a giant crocodile, kangaroo and a menagerie of smaller critters. I was intrigued, but undeterred from my mission to look at real art. At the MCA, I dutifully toured the show with my friend, but many of the works weren’t working, or required so much explanation and intellectualisation to enjoy that I just didn’t. The exception was the one with the motion-sensor triggered measuring tapes. Each tape would rise to wobbly heights (how high depending on how long you stood in front of it) and then come crashing down (narrowly missing hitting gallery visitors). I’m sure I could have made links to masculinity, and measurement and the inevitable fall after the thrilling rise (of men, civilizations, you name it) but really I just I thought it was hilarious. But much as I loved this one piece, it’s the Louis Vuitton critters (which turned out to be a commissioned piece by British artist Billie Achilleos) that remain in my mind months later. Maybe they struck a chord because they were just so honest and unpretentious. And before you start the outraged comments about how can advertising luxury handbags be unpretentious?!! I mean they were not pretending to be anything but what they were; a cunning ploy to make already highly desirable, utterly unnecessary items, even more desirable. Art is used to sell, sell, sell all the time, but rarely is it done with such panache. I suspect there is also some tricksy post-modern irony at play in Achilleos’s critters, something about consumerism, crocodiles and maybe even crocodile tears, not to mention jingoism, national identity and zombies (there is something creepy about making a life-sized animal out of lots of its dead brethren). Either way, they were clever and amazingly well constructed. Artists are often accused of selling out if they make deliberately commercial work. Work that sells is seen as somehow substandard (and often it is) but Achilleos has sold out in order to sell and has still made something amazing. Good to have ThePostPost back. Len Lye does totally rock! My interest was really piqued by this piece, thanks for writing it. I really like creative shop displays and know exactly what you’re talking about. In the 90’s I saw Barbara Kruger and Jenny Holzer, amongst others do the shop displays at Barney’s- and upmarket department store in New York, it was fantastic. Not a sell-out whatsoever. If artists are being paid I think it’s really good. The Hermes store often has amazing windows as well, as a friend used to say; “better than the MCA”. As a matter of fact, in Tokyo, both the Louis Vuitton and Hermes stores have enormous purpose-built galleries where they exhibit contemporary work all year around, so their commitment is enormous. Work that sells is not necessarily substandard, its when the market is driven by something other than the artwork, as investment blue chip commodities, sucking the life out of an honest work. And some people really have no taste at all! I wonder why we don’t see more really interesting window displays by artists? It seems like a lost opportunity. The questions of of commercialisation have plagued art thinking for far too long. The operation of value (money) within the art system is a Borgesian nightmare. Doing straight commercial deals like this commission sometimes feels more honest. When the baggage of fame, value, future value, dead, not dead and investors enter the equation it enters the realm of stock and venture capital. The honesty of the $ transaction was certainly part of the appeal!